Liter of Light is a global, grassroots movement committed to providing affordable, sustainable solar light to people with limited or no access to electricity. 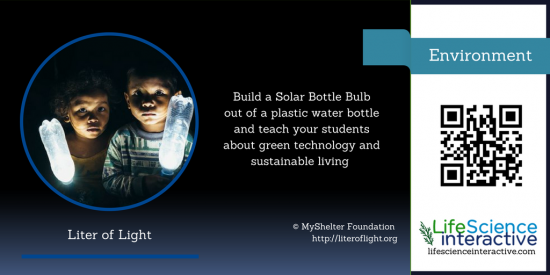 Through a network of partnerships around the world, Liter of Light volunteers teach marginalized communities how to use recycled plastic bottles and locally sourced materials to illuminate their homes, businesses and streets. Liter of Light has installed more than 350,000 bottle lights in more than 15 countries and taught green skills to empower grassroots entrepreneurs at every stop.